It is an well-known fact that all stars have a lifespan. This begins with their formation, then continues through their Main Sequence phase (which constitutes the majority of their life) before ending in death. In most cases, stars will swell up to several hundred times their normal size as they exit the Main Sequence phase of their life, during which time they will likely consume any planets that orbit closely to them. However, for planets that orbit the star at greater distances (beyond the system’s “Frost Line“, essentially), conditions might actually become warm enough for them to support life. And according to new research which comes from the Carl Sagan Institute at Cornell University, this situation could last for some star systems into the billions of years, giving rise to entirely new forms of extra-terrestrial life! In approximately 5.4 billion years from now, our Sun will exit its Main Sequence phase. Having exhausted the hydrogen fuel in its core, the inert helium ash that has built up there will become unstable and collapse under its own weight. 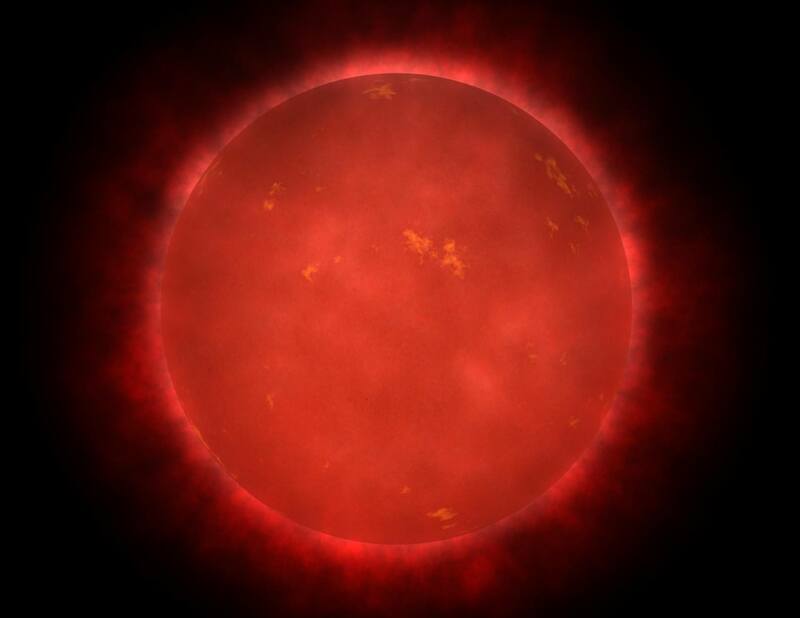 This will cause the core to heat up and get denser, which in turn will cause the Sun to grow in size and enter what is known as the Red Giant-Branch (RGB) phase of its evolution. This period will begin with our Sun becoming a subgiant, in which it will slowly double in size over the course of about half a billion years. It will then spend the next half a billion years expanding more rapidly, until it is 200 times its current size and several thousands times more luminous. It will then officially be a red giant star, eventually expanding to the point where it reaches beyond Mars’ orbit. As we explored in a previous article, planet Earth will not survive our Sun becoming a Red Giant – nor will Mercury, Venus or Mars. But beyond the “Frost Line”, where it is cold enough that volatile compounds – such as water, ammonia, methane, carbon dioxide and carbon monoxide – remain in a frozen state, the remain gas giants, ice giants, and dwarf planets will survive. Not only that, but a massive thaw will set in. In short, when the star expands, its “habitable zone” will likely do the same, encompassing the orbits of Jupiter and Saturn. When this happens, formerly uninhabitable places – like the Jovian and Cronian moons – could suddenly become inhabitable. The same holds true for many other stars in the Universe, all of which are fated to become Red Giants as they near the end of their lifespans. However, when our Sun reaches its Red Giant Branch phase, it is only expected to have 120 million years of active life left. This is not quite enough time for new lifeforms to emerge, evolve and become truly complex (i.e. like humans and other species of mammals). But according to a recent research study that appeared in The Astrophysical Journal – titled “Habitable Zone of Post-Main Sequence Stars” – some planets may be able to remain habitable around other red giant stars in our Universe for much longer – up to 9 billion years or more in some cases! At the same time, they considered how this kind of stellar evolution could effect the atmosphere of the star’s planets. As a star expands, it loses mass and ejects it outward in the form of solar wind. For planets that orbit close to a star, or those that have low surface gravity, they may find some or all of their atmospheres blasted away. On the other hand, planets with sufficient mass (or positioned at a safe distance) could maintain most of their atmospheres. “The stellar winds from this mass loss erodes planetary atmospheres, which we also compute as a function of time,” said Ramirez. “As the star loses mass, the solar system conserves angular momentum by moving outwards. So, we also take into account how the orbits move out with time.” By using models that incorporated the rate of stellar and atmospheric loss during the Red Giant Branch (RGB) and Asymptotic Giant Branch (AGB) phases of star, they were able to determine how this would play out for planets that ranged in size from super-Moons to super-Earths. But perhaps the most exciting take-away from their research study was their conclusion that planets orbiting within their star’s post-MS habitable zones would be doing so at distances that would make them detectable using direct imaging techniques. So not only are the odds of finding life around older stars better than previously thought, we should have no trouble in spotting them using current exoplanet-hunting techniques! It is also worth noting that Kaltenegger and Dr. Ramirez have submitted a second paper for publication, in which they provide a list of 23 red giant stars within 100 light-years of Earth. Knowing that these stars, all of which are in our stellar neighborhood, could have life-sustaining worlds within their habitable zones should provide additional opportunities for planet hunters in the coming years. And be sure to check out this video from Cornellcast, where Prof. Kaltenegger shares what inspires her scientific curiosity and how Cornell’s scientists are working to find proof of extra-terrestrial life. When the sun becomes 2 AU in diameter, it would just reach Earth’s orbit and not go beyond Mars’ orbit? Wikipedia have Mars’s semi-major axis at 1.5 AU, so a 2 AU large Sun would definitely reach beyond Mars’s current orbit. A 2 AU diameter sun would have a radius of 1 AU. Seriously, UniverseToday? The “Make oodles of money at home by futzing around on the laptop” spam gets through, but if I post a link debunking a perpetual motion scammer, that gets moderated to oblivion. What is up with that? Our discussion software is very suspicious of anyone posting links into the comments, since the spammer hit our comments really hard. I’ll check the moderation queue. Yes, but the actual spam links get through without any problem at all.